Somehow this idea of hers was very controversial. 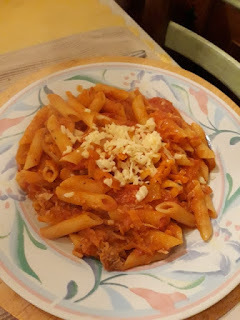 Mine was made with onions, garlic, rasped carrots (and probably bell peppers but since the picture is from last week I forget) which were stir-fried first, then I added pasta, water, a jar of stewed tomatoes and a can of tuna. It tastes quite decent, but don't forget to stir while cooking so that your pasta gets equally cooked on all sides!